No. 29, Jalan Balakong Jaya 1, Taman Industri Balakong Jaya, 43300 Balakong, Selangor, Malaysia. Multicare Industries Supply is one of the fast growing independent manufacture and marketing of packaging material since 1992. 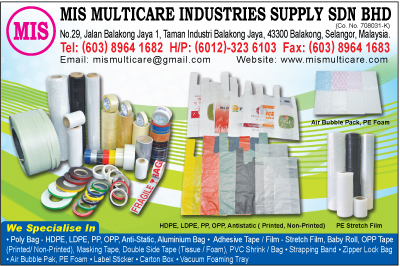 MIS Multicare Industries Supply Sdn Bhd with its early inception in packaging consultant services have moved over the year into provide total solution to meet customers requirement. The success of the company is based on our quality product and qualified personnel who undergone thorough training, and hence the means of satisfying our customer. MIS Multicare Industries Supply Sdn Bhd policies are total customer satisfaction, an effective top class packaging trading house and continuous quality improvement in both products and services.